Education, defense ministers reach agreement to save religious pre-military academy. 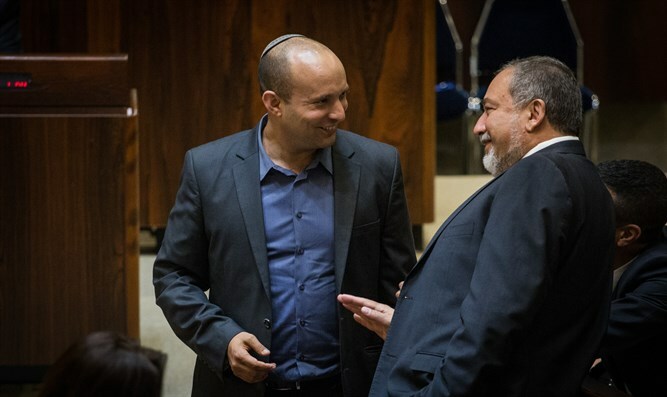 Education Minister Naftali Bennett and Defense Minister Avigdor Liberman signed an agreement that regulates the continued operation of the military boarding school in Ohr Etzion Thursday. According to the agreement, the Ministry of Education will fund the ongoing cost of the military boarding school, with responsibility for its management transferred from the IDF to the Ministry of Defense's Social Security Division similar to the military boarding school in Haifa. It was further agreed that the Ministries of Education and Security would jointly finance the renovation of the boarding school, amounting to NIS 9 million, and bringing it up to civilian standard sin terms of safety, accessibility and welfare for students. The Ministry of Defense will bear the balance of the sum and will be responsible for the execution. The memorandum of understanding signed by the directors-general of the two ministries will allow the military boarding school to be opened in early 2019, and by this time the next class will begin its studies at the Ohr Etzion yeshiva. Education Minister Naftali Bennett said this was an important achievement. "I am happy that we succeeded in removing the threat of closure from the Ohr Etzion boarding school, which is a highly educational institution that has educated generations of commanders in the IDF and has admired the love of the people and the country. "The Ohr Etzion boarding school is the essence of Zionism, and there was no reason to close it in the first place, so I decided that it would be the Ministry of Education that would fund the boarding school so that it could continue its blessed activities for the people of Israel and the State of Israel." Bennett added. Defense Minister Avigdor Liberman said that "the military boarding school in Or Etzion is a magnificent educational institution that should be nurtured and not closed, just like the military boarding school in Haifa, whose existence I have promised for years to come. I thank all those involved in the effort. The State of Israel will benefit generations of commanders and fighters who will continue to influence the State of Israel, the IDF and the entire society." The agreement ended a controversy which began with the decision of former Defense Minister Moshe Ya'alon to close two pre-military preparatory high schools, including a boarding school in Haifa and another near the Ohr Etzion yeshiva. Ya'alon's successor, Defense Minister Avigdor Liberman, decided to close the Ohr Etzion pre-military yeshiva high school altogether and to permit the boarding school in Haifa to remain open with changes made to its operations. The Ohr Etzion yeshiva has been in existence since 1983.